A less happy moment between Eisinin (Sergei Andreev) and Duncan (Lisa Channer) in Theatre Novi Most’s production of Dancing on the Edge. In reading through the top 10 lists of other reviewers, I realized there were a lot of great shows that I missed this year. The Twin Cities is blessed with an abundance of wonderful theatre and it simply not possible to see or review every worthy show. This year, I made a special effort to take in many of the smaller theatres and was well rewarded, since many of those shows made my list. Doing my list this year was especially difficult because I originally had fourteen best shows. With great difficulty, I pared the list to the following top 10 and two honorable mentions. These listings are in alphabetical order. 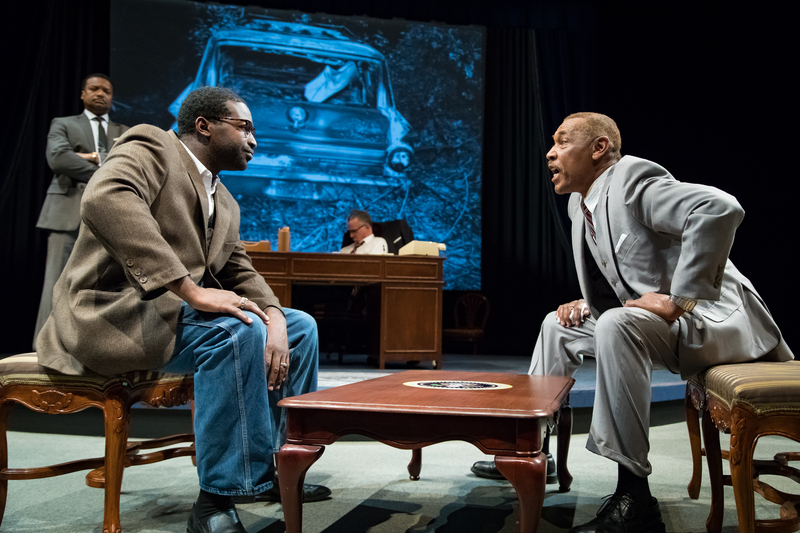 All the Way (History Theatre): Director Ron Peluso grabbed the audience’s attention at the start of this drama about the passage of the 1964 Civil Rights Act and never let go until the performance’s end. Playwright Robert Schenkkan’s Tony Award-winning play provided an engrossing story about U.S. President Lyndon Baines Johnson (LBJ) and his legislative maneuvering in the wake of President Kennedy’s assassination that resulted in the passage of this historic act. Peace Bunting succeeded in playing LBJ as the complicated and flawed man that he was. Other cast standouts included Andrew Erskine Wheeler as the beleaguered but effective Human H. Humphrey, and Peter Thomson as LBJ’s mentor Senator Richard Russell. This rich political drama is a valuable insight to the American political psyche. Parallel arguments in the History Theatre’s production of All the Way. Pictured: Ron Collier, Joe Nathan Thomas, Shawn Hamilton, and Pearce Bunting. Photo by Rick Spaulding. 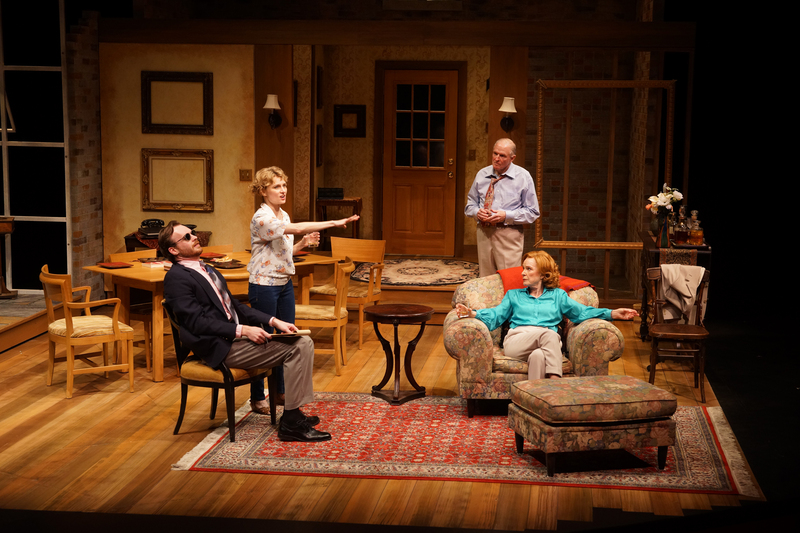 Amy’s View (Park Square Theatre): Director Gary Gisselman staged an engrossing production of British playwright David Hare’s wordy play. The play concerns how abusive relationships can result in the estrangement of loved ones who observe the abuse from the outside and are unable to rescue their loved ones. The show had an outstanding cast. Linda Kelsey dominated the production as a domineering, yet caring mother who is helpless to protect her daughter. Tracey Maloney, as the “too-giving” daughter Amy, and Gabriel Murphy, as her self-absorbed husband, nicely balanced Kelsey in the show’s constant wordplay. This tragic odyssey inspired thoughtful reflection lasting long after the show’s end. The cast of Park Square Theatre’s Amy’s View. Photo by Petronella J. Ytsma. 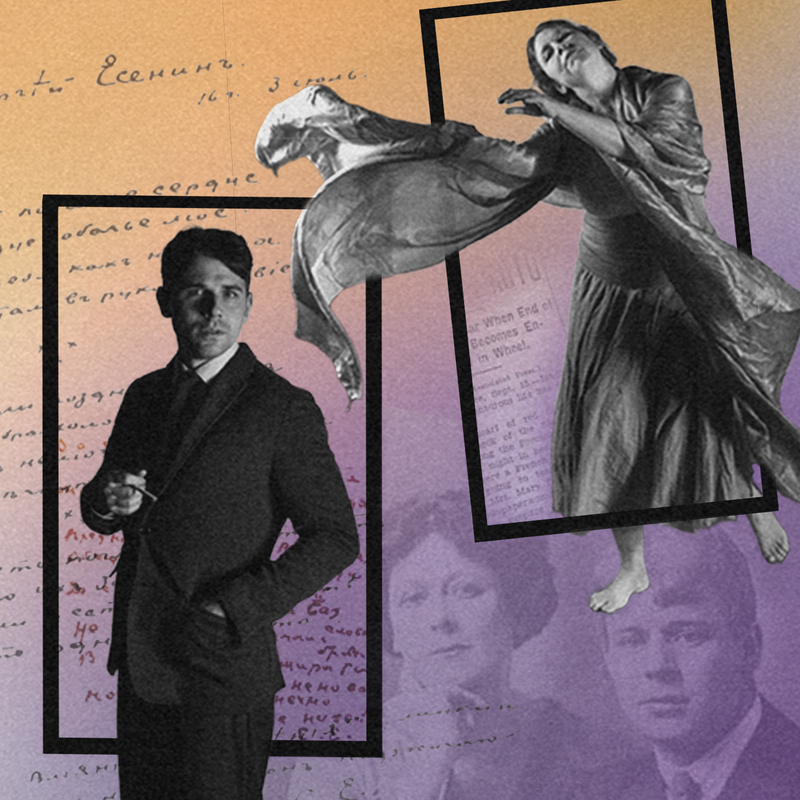 Dancing on the Edge (Theatre Novi Most): Adam Kraar’s play about Isadora Duncan, an American pioneer in modern dance, and her relationship with the well-known Russian poet Sergei Esenin intrigued me from the theatre’ first email announcement. Duncan’s autobiography was compelling and this play picks up where the autobiography left off (she died before she completed it) with her decision, following the death of her young children, to move to the Soviet Union to establish a school of dance after the First World War. 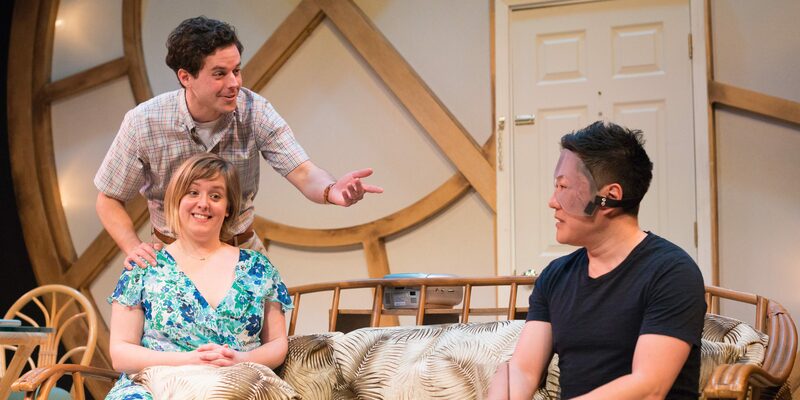 Kraar’s play captures their relationship: passionate but volatile, with problems that they could not overcome including Eisenin’s drinking and the couple’s lack of a common language. The performances of Lisa Channer as Duncan and Sasha Andreev as Esenin provided a touching insight as to these two tortured artists. A promotional image for Theatre Novi Most’s Dancing on the Edge. Grace (Yellow Tree Theatre): This powerful production of a multiple murder/suicide is shown in reverse slow motion. It involves a business man who plans to create a chain of Christian-based hotels with the slogan “Where will Jesus sleep.” His business venture fails and his fixation with his business leads to the alienation of his wife who finds comfort with a neighbor. Playwright Craig Wright’s thought-provoking play centers on belief systems and what happens when they prove to be insufficient. Compelling performances by Terry Hempleman (also the director), Mary Fox, Jason Peterson, and Kurt Kwan drove this show to its ultimate carnage, leaving the audience numb at the end. The cast of Yellow Tree Theatre’s Grace. 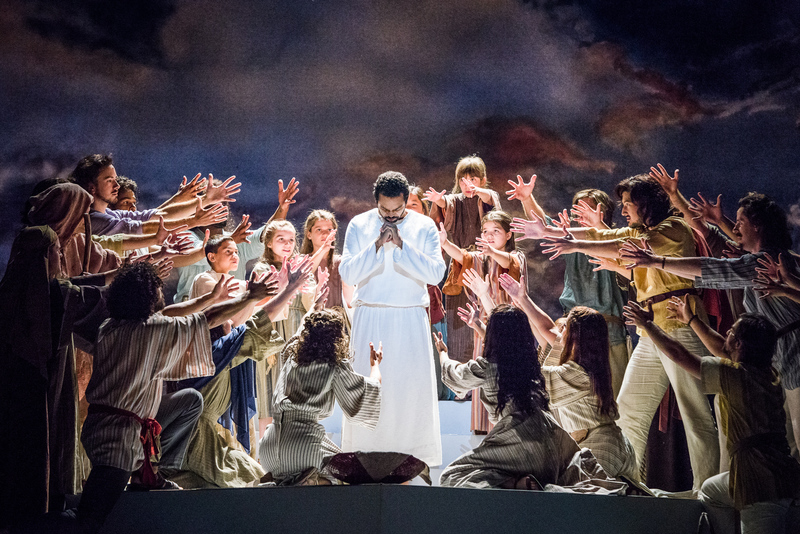 Jesus Christ Superstar (Ordway Center for Performing Arts): This Ordway local production created a crowd-pleasing production of Superstar with fantastic singers and dazzling choreography. Under director and choreographer James A. Rocco and musical director Andrew Bourgon, the production brimmed full of energy and enthusiasm. Both Jesse Nager as Jesus and Randy Schmeling as Judas were powerful singers. Lauren Villegas’s portrayal of Mary Magdalene nearly brought down the house with her rendition of “I Don’t Know How to Love Him”. This joyous production richly deserved the audience’s resounding standing ovation on opening night. Jesse Nager as Jesus (center) with the cast of the Ordway’s Jesus Christ Superstar. Photo by Rich Ryan. Man of La Mancha (Theater Latté Da): This powerful musical invigorated its audience to take on the windmills of today. Martin Sola as the actor Miguel de Cervantes faced a mighty enemy (the Spanish Inquisition) with an inspiring everyman performance. Megan Kreidler created a powerful image of the skeptical and victimized barmaid Aldonza, who finds that Don Quixote’s dreams give meaning to her life. With a rousing supporting cast, Director Peter Rothstein and Music Director Denise Prosek created an exhilarating production that lingers long after the curtain closes. Martín Solá and Zachary Garcia ride out in the play-within-a-play in Theater Latté Da’s production of Man of La Mancha. Photo by Allen Weeks. 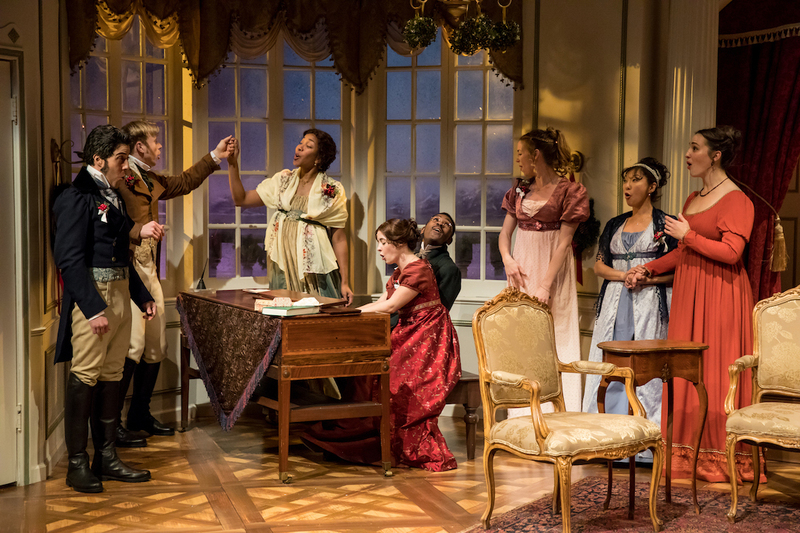 Ms. Bennet: Christmas at Pemberley (Jungle Theater): A genuinely funny and entertaining show that was just right for holiday cheer. Playwrights Lauren Gunderson and Margot Melcon have created a joyous sequel to Jane Austin’s classic novel Pride and Prejudice with a story about the middle sister Mary Bennet. Christian Bardin as Mary and Jucoby Johnson as her suitor Arthur provided both wit and great physical humor with their braininess and mutual social awkwardness. One can only hope that this show will be a perennial seasonal favorite at Jungle Theater. Fitzwilliam Darcy (James Rodríguez), Charles Bingley (Sam Bardwell), Jane Bingley (Adia Morris), Mary Bennet (Christian Bardin), Arthur de Bourgh (JuCoby Johnson), Lydia Wickham (Kelsey Didion), Elizabeth Darcy (Sun Mee Chomet) and Anne de Bourgh (Anna Hickey) are home for the holidays in the Jungle Theater’s production of Miss Bennet: Christmas at Pemberley. Photo by Dan Norman. 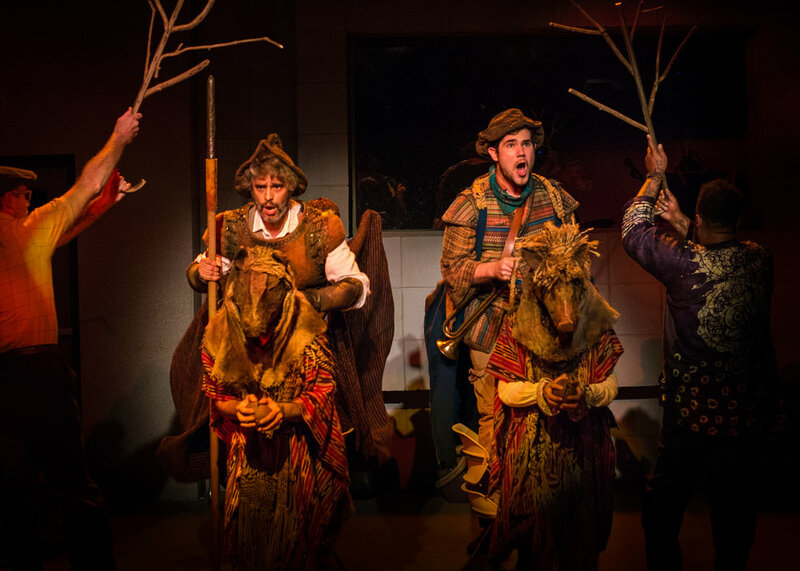 The Story of Crow Boy (In the Heart of the Beast Puppet and Mask Theatre (HOBT)): I missed this much praised show in 2016 but was fortunate when HOBT chose to reprise this masterpiece in 2017. Blending puppetry, video projections, pencil etchings, and a costumed crow, HOBT recreates the life of Taro Yashima, a pacifist Japanese artist and writer who fled a militaristic regime in Japan during the 1930s. He worked for the American government during World War II and documented the aftermath of the dropping of the atomic bombs by returning to Japan and interviewing survivors. 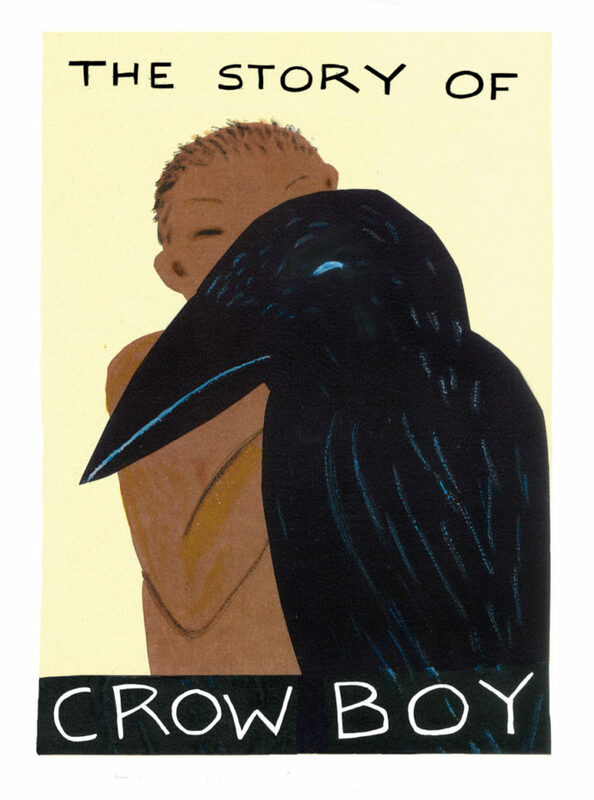 The show deftly weaves Yashima’s story with the story in Yashima’s children’s book Crow Boy. HOBT’s Artistic Director Sandy Spieler created this both charming and wrenching story with Masanari Kawahara, Steven Epp, and the hauntingly beautiful singing of Momoko Tanno. Promotional art for Heart of the Beast Theatre’s The Story of Crow Boy. Native Gardens (Guthrie Theater): Playwright Karen Zacarias has written an uproarious play about racial issues, social class and gardening. Director Blake Robinson created a constant comic tension with the verbal sparring between new neighbors played by Dan Domingues and Jacqueline Correa, and the established neighbors played by Steve Hendrickson and Sally Wingert. The cast was picture perfect, and the witty repartee was in constant play when flowers are used as a metaphor to spout off about racial and class stereotypes. Native Gardens is one of the few plays whose humor was so wonderful that I chose to attend a second time. 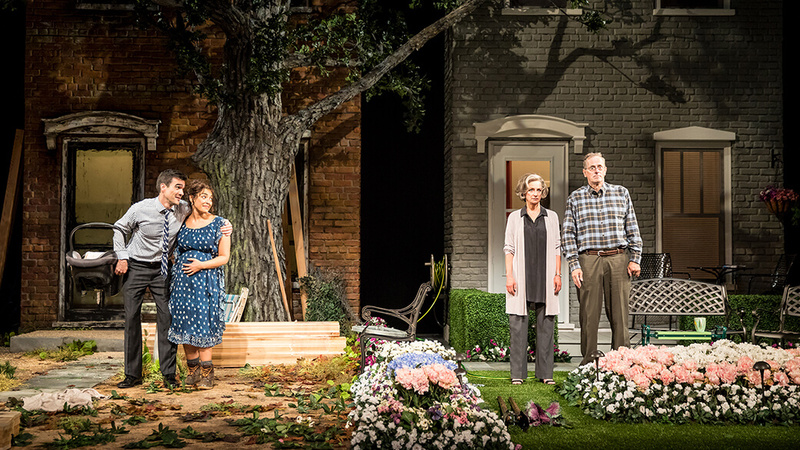 Dan Domingues, Jacqueline Correa, Sally Wingert, and Steve Hendrickson played feuding neighbors in the Guthrie Theater’s Native Gardens. Photo by Dan Norman. 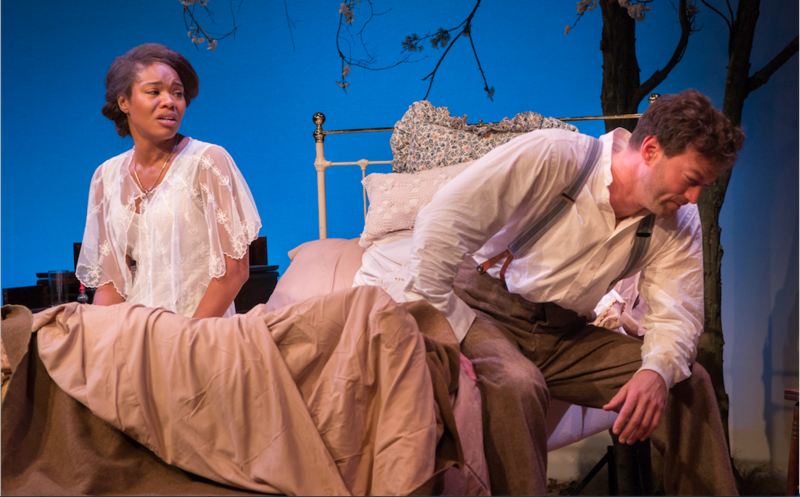 Wedding Band: A Love/Hate Story in Black and White (Penumbra Theatre): Playwright Alice Childress wrote this explosive play about race relations in America, set during the final year of World War I. Director Lou Bellamy’s production captured the comedy and warmth of the play while also shocking audiences with the underlying racial hatreds held by the characters. Dame-Jasmine Hughes was well-cast in the difficult role of the mild-mannered African-American seamstress Julia who ultimately explodes with racial hatred when her white lover Herman is dying. Other fine performances were provided by Peter Hansen, Ivory Doublette, Darius Dotch, Austene Van, George Keller, and Jen Maren. Laura Esping played Herman’s mother, the least likeable character in the play, with great passion. This play and its production pushed its audience members to confront the ugliness of racism and how it damages lives on a personal basis. The course of love did not run smooth for Julia (Dame-Jasmine Hughes) and Herman (Peter Christian Hansen) in Penumbra Theatre’s production of Wedding Band: A Love/Hate Story in Black And White. Photo by Allen Weeks. Hatchet Lady: Carry Nation, Angel of Destruction (Walking Shadow Theatre Company): This play had the feel of a work in progress, but it definitely had its moments. The show’s structure was uneven – especially at the end – but Maren Ward gave a compelling performance in the dual roles of Carrie Nation and her biographer Frances. The musical integration needs help, but when Ward and Chelsie Newhard (as Carrie’s drunkard husband Charlie) sang a country love song together, the show had me hooked. The Abominables (Children’s Theatre Company): The Abominables is an entertaining story about acceptance, team work, and the belief that one is happier being nice rather than mean. Composer Michael Friedman, who passed away just days before the musical open, wrote the show’s catchy music and lyrics. Playwright Steve Cosson also served as the director of this world premiere musical about hockey in Minnesota. The first two-thirds of the musical are great and Autumn Ness gave us the most memorable musical moment with her amazing performance of “Minnesota Nice.” The last third of the show has story flaws and needs a tighter structure.